Despite the continued visitor success of the more famous country houses such as Castle Howard, the closure of Cherkley Court in Leatherhead, Surrey, to the public shows that the smaller houses can find it much harder to make a profit. The house was built in the 1860s but rebuilt in a French chateau-style following a serious fire in 1893 and was home to the press baron Lord Beaverbrook. Now the charitable Beaverbrook Foundation which owns the house has decided that their funds can no longer subsidise the running of the house. Previously the grounds had been open to the public and a new cafe and gift shop had been built in 2008 but even this failed to lift visitor numbers sufficiently. So what does the future hold? The foundation have confirmed that it will honour all events and weddings already booked but will not be taking any more. Although the house and estate was recently valued by Savills, it’s unlikely (though not impossible) that it might be put up for sale. However this might actually be good solution as the many millions the sale would surely raise would be a healthy boost for the Foundation’s other charitable work but would also ensure that the house was in use which is the main protection against creeping neglect. Fingers crossed that whatever the outcome, this interesting house is preserved for the future. This entry was posted in News and tagged cherkley court, country house, surrey. Bookmark the permalink. Sadly, it is likely that some or all of the Cherkley Court estate will be sold by the debt-ridden Beaverbrook Foundation in late 2010, once all Cherkley’s legal commitments to wedding bookings have been honoured, and the Foundation’s other remaining assets sold. This predicament results from the Foundation’s September 2009 unsuccessful arbitration appeal, where the Foundation (http://www.beaverbrookfoundation.org) was in dispute since 2003 with its sister charity, the Beaverbrook Art Gallery in Canada (http://www.beaverbrookartgallery.org), over the ownership of the Gallery’s core £60m art collection (http://www.nationalpost.com/scripts/story.html?id=1977535). The arbitrator, retired Canadian Supreme Court Justice Peter Cory, had ruled in March 2007 that only 48 of 133 artworks were owned by the Foundation, worth only about £6m. The sale of the artworks is unlikely to even cover the Foundation’s debts, owing over £3m (in 2007) to the London-based EFG Private Bank (http://www.efgl.com), and £3m Gallery legal costs. The Foundation has incurred £5m of its own legal costs over the past 6 years, which combined with the £7m spent on renovating Cherkley Court in 2003-7, has wiped out the Foundation’s substantial share portfolio (http://www.business.timesonline.co.uk/tol/business/law/article5026334.ece). 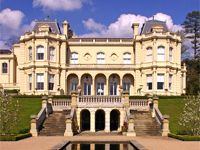 The Foundation’s only other chance of keeping Cherkley Court is to seek planning permission to subdivide and redevelop part of its 380 acre estate, near Leatherhead and the M25 motorway, similar to the neighbouring Givons’ Grove estate (http://www.givonsgrove.com). The whole Cherkley Court estate was valued by Savills in January 2007, before the recession, at between £18m to £20m. For further reading on the saga, see the 2008 book “Beaverbrook: A Shattered Legacy” by Jacques Poitras (http://www.amazon.co.uk/dp/0864925220). It would now seem that Cherkley Court has been sold to a very rich Russian who does not want anyone to know the sale has gone through. What is your source for this comment? I don’t believe this is correct, because the Savills website is still showing Cherkley Court for sale. I am guessing that you read this on a Flickr comment, which is over 8 months old, well before the house was launched for public sale in September 2010, which would not have been done if it had already been sold.